In my reading this week in preparation for preaching I was reminded by one writer of the “Butterfly Effect” and its relationship to our first reading today. The term is from meteorologist Edward Lorenz, and describes an aspect of chaos theory which describes how a small change at one place a non-linear system results in large changes to a later state of that system. A butterfly flapping it's wings, for instance, can have an effect which may lead to the development of a hurricane. The Butterfly Effect in physics is an apt image upon which to call in considering the story of Shiphrah and Puah, two courageous woman who served as midwives to the Hebrew woman living in the land of Egypt. Their story deserves more attention than it gets. We've been reading the saga of Joseph and his exile in Egypt and the developments that follow. That saga of the Bible explains why the Hebrew people are living in the land of Egypt. Today's part of the story tells us that the ascent of a new Pharoah; one of those tiny-minded and heard-hearted brutes of history who do the Big Stupid Things. His tiny and fearful mind divides the world into “us” and “them”, and the Hebrews in the land suffer. First he decrees slavery and exploitation, and then a plan for genocide. Here's where Shiphrah and Puah show their stuff. When Pharaoh tries to enlist these midwives of the Hebrews in his murderous plan, they resist with cleverness and courage, out of a respect for God. Ultimately, their resistance inspires more resistance, even going to the heart of the Pharaoh's own family. The life of a boy is preserved; a boy who will one day lead the Hebrews out of their slavery. Also in this story is a woman whose attachment to her beautiful baby boy motivates her resistance. Also in this story is a princess acting out of the quality of mercy and pity. Here's a story in which we see that small actions by a few lead to a large result. The Butterfly Effect. Shiphrah and Puah fear God. A mother loves her baby, and a princess shows that cruelty and stupidity isn't hereditary, and God uses all of that to advance God's own purposes in history. The power of God is the power of mercy, and God's intention is that the Church be the agents of that mercy among all people. How do we become the agents of God's mercy? We do so when we go out these doors as those who've received the Baptism into the image of the merciful Lord Jesus, been fed at his table and strengthened for service. We do that as the actions we intend and the actions we take ripple out from their starting point with us into the world, affecting a chain of consequences we cannot possibly know. We had a reminder of that recently in the case of Rachel Beckwith, the nine-year-old Bellevue girl who in May asked that instead of gifts on her birthday that people send donations to her favorite charity to enable water projects in Africa. Her goal was $300 by her birthday. In July she died in a traffic accident on I-90, and in August her fundraising goal topped $1,000,000 and was still climbing. “...life is not life as long as it is only in the mind, or even in the heart; that it is only life when it has been converted into life. Christianity has only begun when it begins to live what it believes and what it feels: "If ye know these things, blessed are you if ye do them." The actions you and I take this week as intentional acts for the love for our merciful God may be small, or they may be greater. You may find yourself acting on the small stage of the ordinary associations you have with people in the family or the workplace. Some of you may find your actions stemming from a concern that is on a broader stage: a concern for right action on behalf of those without a political voice and power; a concern for those discriminated against to the denigration of their human dignity. You may find your actions directed toward the correction of a political system enslaved to corrupt speech and the undue influence of wealth. You may find your actions directed by concern about the human effect of vast inequities between rich and poor in this country, or by concern for the groaning of Nature under the burden of human carelessness and greed. In our world there's plenty of reason to act, and plenty of opportunity to live the legacy of Shiphrah and Puah, who feared God. Today we celebrate life as followers of Jesus, gathered by the Holy Spirit for story and song and ritual meal. Talk about Butterfly Effect! A man with 12 disciples changed the world forever! In his power we can change our world too. It all starts with small things. What's going to be our action this week? 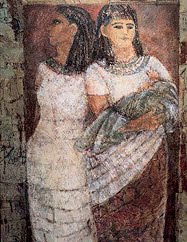 Image: Puah and Shiphrah Defy Pharaoh, by Sallie Clinton Poet, oil on canvas (121 cm x 89 cm.